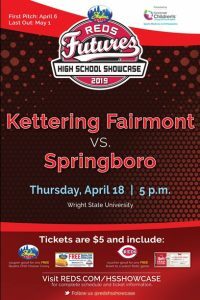 SUPPORT YOUR FAIRMONT VARSITY BASEBALL TEAM WHEN THE FIREBIRDS PLAY IN THE REDS FUTURES HIGH SCHOOL SHOWCASE ON THURSDAY,APRIL 18. FAIRMONT TAKES ON SPRINGBORO AT 5 P.M. AT WRIGHT STATE UNIVERSITY. ADMISSION TO THE GAME IS $5, PLUS YOU GET A VOUCHER GOOD FOR A FREE VIEW LEVEL TICKET TO A SELECT 2019 REDS’ GAME AND A COUPON GOOD FOR A FREE SKYLINE CHILI CHEESE CONEY. RECEIVE ALL THE ABOVE FOR $5, WHEN FAIRMONT PLAYS SPRINGBORO ON THURSDAY, APRIL 18 IN THE SKYLINE CHILI REDS HIGH SCHOOL SHOWCASE.